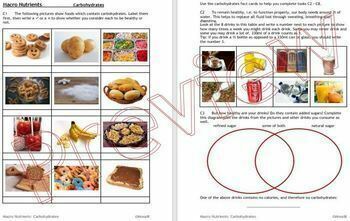 Food Preparation and Nutrition: This BUNDLE includes a 3 workbooks + 24 fact cards to support students’ work, 118 picture cue cards and 118 flash cards (half page) for a variety of activities, as well as 3 presentations of the same pictures to introduce students to the topics of carbohydrates, fats and proteins in food and drink. A document with suggestions for use and differentiation is also included in each resource. The workbooks and fact cards are ideal for classwork, homework, revision, consolidation and cover work. If you like this BUNDLE, please leave me a review. Follow me to see what I publish in the future and to receive notifications of updates. Look out for my other bundles which will save you time and money for even more learning opportunities. 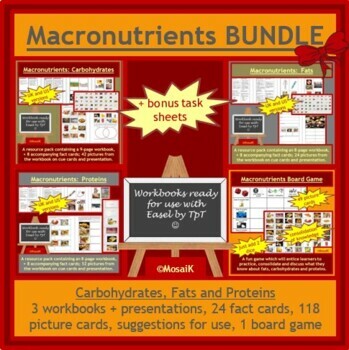 Bonus file including a reading activity and a Macro-Nutrients self-evaluation sheet. Out of fairness to me and to reflect the time I spent designing this resource, please be sure to purchase a multiple license if you intend to share it with colleagues anywhere. Thank you.